It isn’t just the blood that is important to your health. The lymph is the fluid that bathes the brain and spinal cord, carries immune cells throughout the body, removes excess fluid and waste material from cells and cleanses all the fluid that surrounds every cell of our body. The lymph is in many ways even more important than the blood and yet it relies on rhythmic movement such as walking, running and bouncing to pump it throughout the nodes and vessels of the body. The lymph moves just below the skin and so is a key component of our ability to detoxify. When the lymph becomes congested then our body has to find ways of storing and minimizing the negative effects of our toxic load. What begins as simply a cyst, psoriasis or acne becomes over time edema, chronic infections, vision issues and breathing difficulties. The longer we think our symptoms are unimportant, the more serious conditions will become. This is for first time patients or those focusing on just one or two areas. A session begins with opening all the pathways of lymphatic drainage in the body at the sternum, clavicle, axillary region and inguinal region. This is an intensive approach to decongesting and mobilizing the lymph system using Chromalight Therapy, vibration and gentle suction of the superficial tissues with an organic lubricating essential oil blend. This can be done weekly. Utilizing heat at various points in the session, this decongests the entire body including the face and head while spending focused time on key areas of congestion such as the liver and kidneys. Balancing the dominant Chinese element of the body with the appropriate oils and clays, vibration, suction, Chromalight treatment and Acupoint stimulation are combined to mobilize the immune system and reduce symptoms of toxicity and congestion throughout the face and body. This is recommended monthly. This is a comprehensive, intensive lymphatic drainage therapy from head to toe interweaving multiple layers of Elemental Chinese clays, detoxifying oils and heat application. With periods of deep breathing and relaxation, this is the ultimate treatment for any autoimmune disorder, lymphedema case or systemic toxicity. This includes a take-home kit including a detox bath, poulticing clay and a Spagyric lymph drainage remedy. This is recommended seasonally. Radiographic scan of congested lymph nodes. 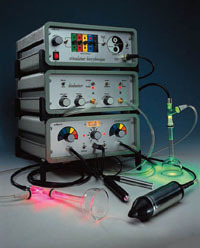 Manual lymph drainage began with the Vodder technique developed in France. However, with manual lymph drainage its effectiveness depends on the skill of the therapist and the size of the therapist's hand in encircling a lymphatic area to apply consistent pressure. The other problem with manual lymph drainage is that the effects are short-lived necessitating frequent sessions in order to maintain any effect at all. Decongestive Lymphatic Therapy is a gentle suction therapy done with glass cups, a rhythmic vibration, Chromalight therapy and energetically active clays and oils. The results can last one week to one month and with regular sessions can last even longer. This therapy has won awards in Europe for its beneficial effects for Lymphedema.